July is a fun-filled month. It means the start of summer vacation for myself and the kids, and it starts off with a bang - Canada Day! This July also marked the PanAm Games here in Toronto as well as National Chocolate Day on July 7. But for our family, it's also the month where we celebrate several birthdays and anniversaries. Of particular note was my daughter's 10th birthday. 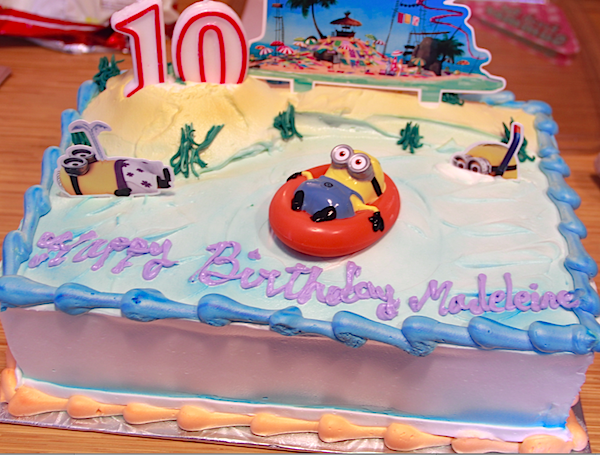 To celebrate this milestone year, we threw her a special Minion-themed party. She originally wanted an Inside Out theme but she changed her mind when she saw Minion party goggles and matching plates at Walmart. We also picked up some customizable drinking cups in yellow with a peel and scratch so guests could write their name or draw their own Minion eyes. My daughter also thought of purchasing yellow balloons so she could draw a number of Minion faces and decorate our main floor. And we can't forget the cake! We ordered a double chocolate Minion cake from Longo's, which was absolutely delicious. 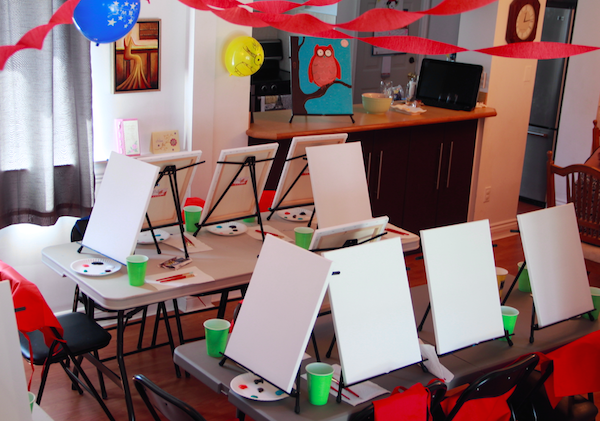 For the party, we decided to try something different and went with a painting party. My daughter wanted to paint something a little more 'artsy' than a Minion cartoon so she went with something that had equally large eyes - an owl. First of all, let me tell you how much I value quiet. But given that it was a party with 16 kids and 10 adults, I prepared for three hours of high volume fun. Instead, it was the complete opposite. I mean, they still had fun. But for the first 45 minutes, the kids were concentrating so hard on their paintings, they barely said a word. You could hear a pin drop! In total, it took about an hour and a half to complete the painting which meant the kids could have some fun outside while their paintings dried. They also played "Pin the Pocket on the Minion" before enjoying some cake. Since they each got to take home a beautifully painted pièce de résistance, I didn't see the need for your typical loot bag. 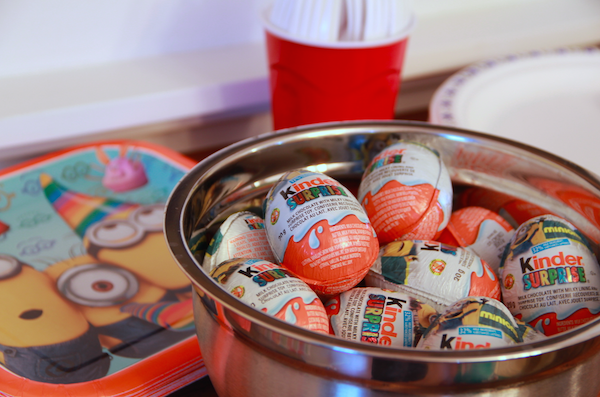 Instead, each guest left with a Kinder Surprise Egg. Minion-themed, of course! I am so happy that the painting party was incredibly well organized. All the materials were provided and I didn't have to worry about setup or cleanup. Plus, it was so nice to see our guests leave the party with giant #KinderSmiles across their faces. They were so proud of their work, as was I. I sure hope they enjoyed their Kinder Surprise. I know I did. Times two. Looking for some fun activities and games that you can enjoy with the family? Check out the Kinder Canada Facebook page. They have introduced Fun for FREE Fridays where they will feature fun and free things families can do together. And don't forget to enter their contests, too! Happy belated birthday to your daughter! 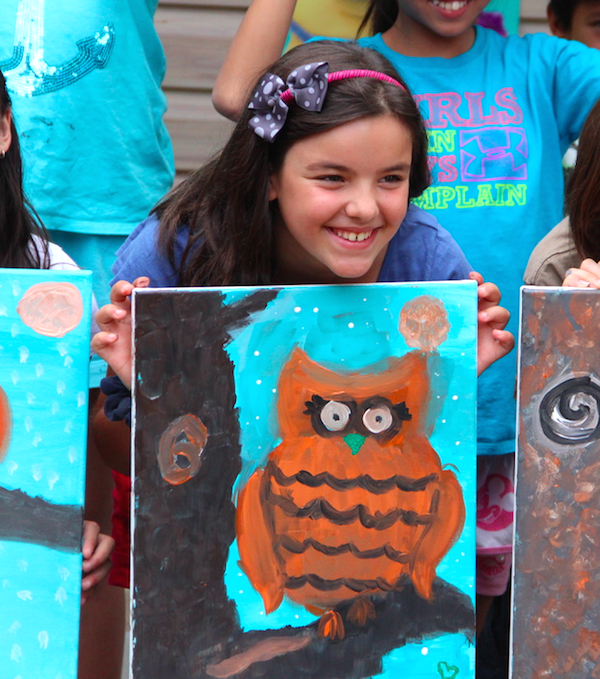 What a cool idea to have a painting party - great way to keep busy and be creative! Thank you! My kids have never been to a painting party before so I wasn't sure how it would turn out. So glad the kids enjoyed it! Looks like we have a bunch of budding artists on our hands. I thought so, too. They ran out and had to get it from a different location, it was so popular! I know! I'm so impressed by every one! LOL, we ordered the same cake for our little guy who turned 2 years old today and LOVES Minions! His party is on Saturday.